“Look at this! How really weird,” I exclaimed to a colleague. We were standing on the tilted deck of an old, wrecked merchant ship partly submerged off the coast of Papua New Guinea, near the capital city of Port Moresby. At my feet, a hundred or more sea snakes lay on the rusty deck, some stretched out side by side, others in tangled clusters. All were more or less still. Yellow-lipped sea kraits they were (Laticauda colubrina), their two- or three-foot-long bodies dressed in alternating bands of gray-blue and black. It wasn’t their aggregation on dry land, as it were, that surprised me—sea kraits are amphibious and known to gather in large groups occasionally. But, like shipwrecked sailors, nearly all of them appeared emaciated, and I could not imagine the reason. It would be more than passing strange for so many in a single population to be unable to find enough fish to eat. That was in 1975. In the intervening decades I’ve replayed the scene in my mind now and then, each time returning to the question: what was wrong with those sea snakes? In hindsight, and with the benefit of additional research into sea snake physiology, I’m almost certain it wasn’t hunger plaguing them. Although surrounded by the vast waters of the Pacific Ocean, they were most likely severely dehydrated. They might even have been early harbingers of climate change. Of the myriad and diverse creatures of the sea, most evolved right there in the saltwater. But a handful of them, including sea snakes, are secondarily marine, having evolved from terrestrial ancestors. 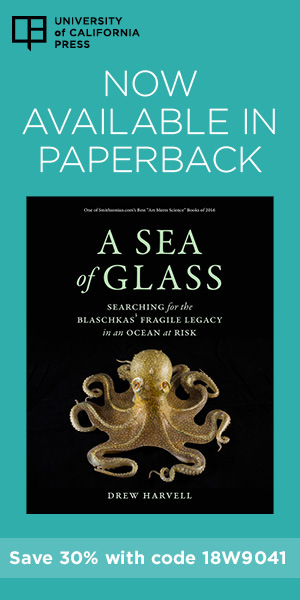 The evolutionary transition from one medium to another is difficult, and the switch from air on land to seawater presents special problems.Chief among them is obtaining enough water to stay properly hydrated: the high concentration of salts in seawater poses a challenge to maintaining the less-salty body fluid that most terrestrial organisms and their marine descendants possess. Ancient mariners learned that we humans become seriously dehydrated if we drink seawater (an act called “mariposa”). Our kidneys cannot concentrate urine sufficiently to conserve enough water while eliminating the excess ingested salt. Marine mammals, by contrast, can excrete more concentrated urine than ours, and they have digestive-system adaptations that enable them to extract the maximum liquid from their food. As a result, marine mammals have no need for freshwater. It remains unknown whether they, and most other marine vertebrates, drink seawater directly. Marine birds and reptiles have come up with a different solution for eliminating excess salt: specialized glands that secrete concentrated fluids of sodium chloride, the principal salt constituent of seawater. Desert animals, too, are subjected to osmotic stresses, and some excrete potassium salts as well. The list of species known to possess salt glands includes desert birds and reptiles, along with seabirds, marine turtles, the marine iguana, some crocodilians, sea snakes, and terrestrial reptiles living in coastal zones. 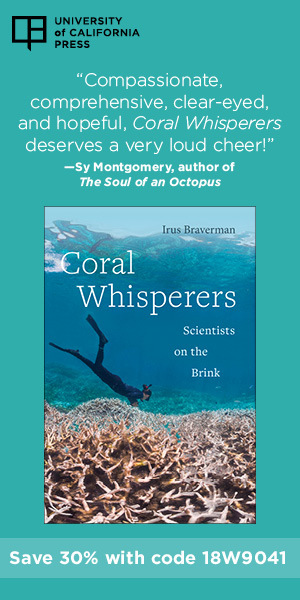 In marine birds and iguanas a salt gland near each eye excretes through the nostrils; in marine turtles the gland is in the eye socket and excretes salty tears; crocodilians have salt glands in the tongue; and sea snakes have them beneath the tongue. Salt glands have been studied almost exclusively in the laboratory, largely by infusing excess salt into an animal—either intravenously, or by pumping saltwater into the stomach—and demonstrating that salt glands secrete highly concentrated salt solutions in response. But there is little information concerning when and how effectively salt glands work in free-ranging animals. Physiologists have assumed that animals possessing salt glands are able to maintain water balance by excreting excess salts ingested in salty substances, such as marine prey or seawater—no freshwater required. It has been standard textbook dogma, for example, that sea snakes drink seawater and, in essence, distill it with their salt glands. But there is always drama in science, and my recent work shows that at least some sea snakes’ salt glands are insufficient to that task, and their water balancing act more complicated than expected. In the 1990s, my colleagues and I studied an unusual marine reptile called the little file snake (Acrochordus granulatus). 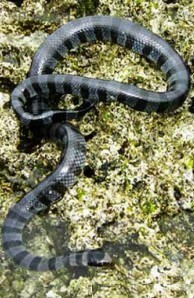 It is the sole marine species in the file snake family, the Acrochordidae, which also contains two freshwater species. 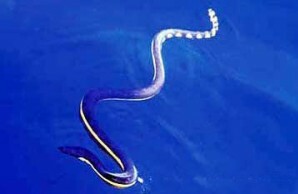 The file snakes are only distantly related to the group herpetologists call sea snakes, which includes the sea kraits. Through a series of observations and experiments, we discovered that the little file snake not only drinks freshwater but requires it to maintain water balance. Most populations of little file snakes live in tropical southern Asia among mangroves or in other nearshore marine habitats. They spend their entire lives in seawater, where they can potentially dehydrate despite possessing a functional salt gland. 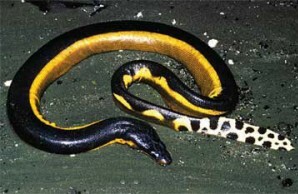 Yellow-lipped sea krait, Laticauda colubrina, is a species the author showed is dependent upon freshwater to maintain water balance, though it spends much of its time in the ocean. It is one of seven sea kraits, amphibious species that come ashore to rest and to lay eggs. Other sea snakes give birth to live young in the water. We further demonstrated that little file snakes eliminate much of their nitrogenous waste in the form of ammonia or ammonium rather than uric acid, as terrestrial reptiles typically do. That is important because the ammonia—a product of protein metabolism—is highly toxic and cannot be allowed to accumulate in body fluids. Nor can it be concentrated or precipitated, as uric acid can be, and it requires comparatively more water to eliminate via the kidneys. Thus the high protein load of the little file snakes’ diet of fish exacerbates their need for freshwater. Indeed, little file snakes that are partly dehydrated cease to eat, presumably to conserve water that they would otherwise expend ridding the body of ammonia. The unexpected freshwater requirement of marine file snakes piqued my curiosity about how sea snakes manage to stay hydrated—particularly in light of that oddly emaciated group on the Port Moresby wreck. Whereas the little file snake is the only marine species in its family, sea snakes have diversified considerably in the sea. Scientists recognize about sixty species in two distinct lineages. The taxonomy is somewhat in dispute, but here, for simplicity, I’ll follow a popular classification that regards those two lineages as subfamilies within the family Elapidae. Sea snakes are thought to have evolved from terrestrial elapids, which today include cobras, land kraits, coral snakes, and numerous other venomous species in Australia. The subfamily Hydrophiinae contains more than fifty sea snake species that are entirely marine. A few are pelagic, but most live near shore, and they all give birth to live young in the water. The subfamily Laticaudinae contains another seven species, all in the genus Laticauda and called sea kraits. 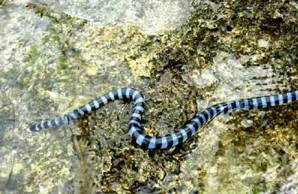 The group is amphibious: sea kraits come ashore to rest and to lay eggs in moist, rocky places along the seashore.